We were five days with Leon Varley. I developed a considerable respect for him and Obeid, the tracker and especially for the large wild animals that we encountered. The bird list mounted up and I added Honey Badger to my life list of mammals. Leon made sure we got our 20 km a day, three square meals and a drink. Our lunch time vigil overlooking the little water hole paid dividends. 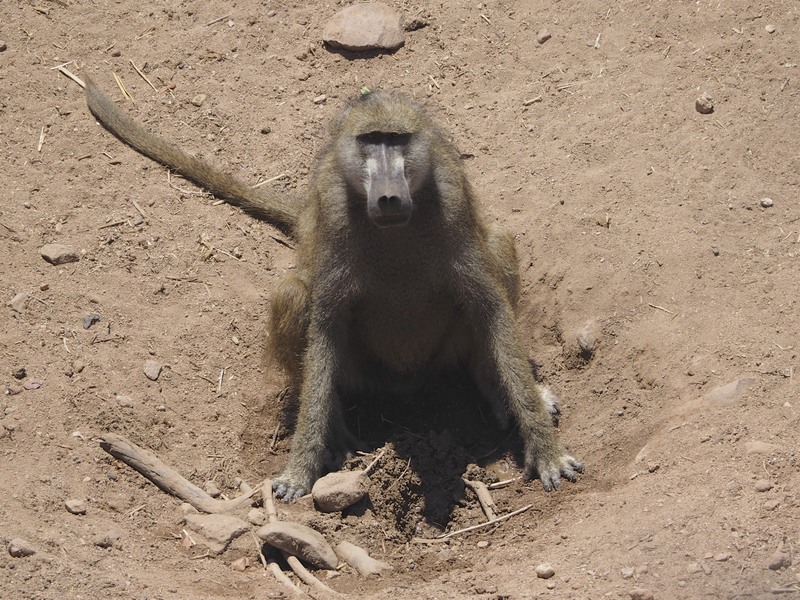 We learnt that in the animal world’s game of rock paper scissors warthog beats baboon. 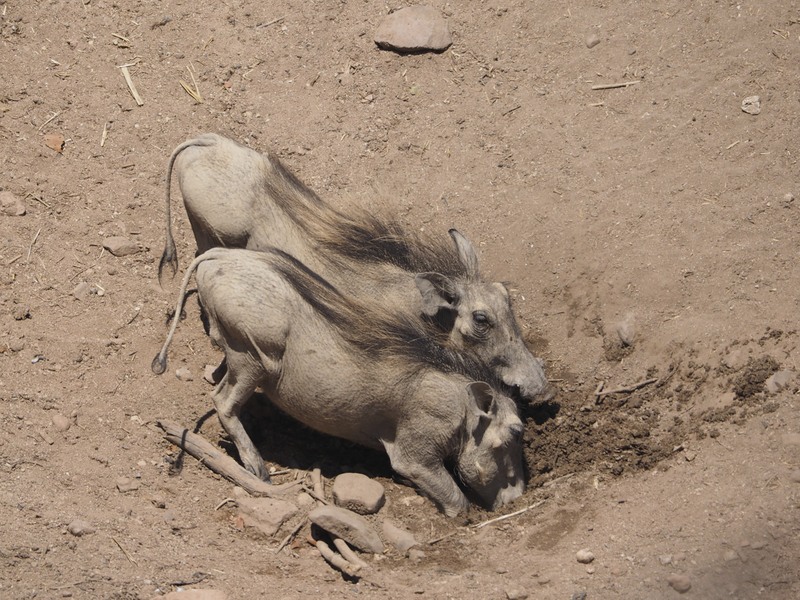 No matter how large the baboon, time at the water was up as soon as a warthog arrived. The poor birds had to wait until all else had vacated. 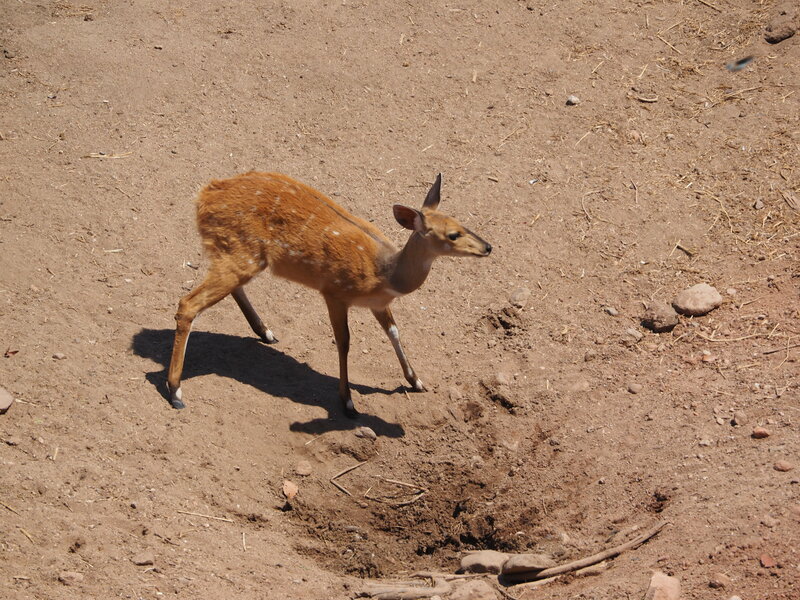 That’s a Bushbuck above. We encountered elephant and giraffe every day. We saw Lions on two days. 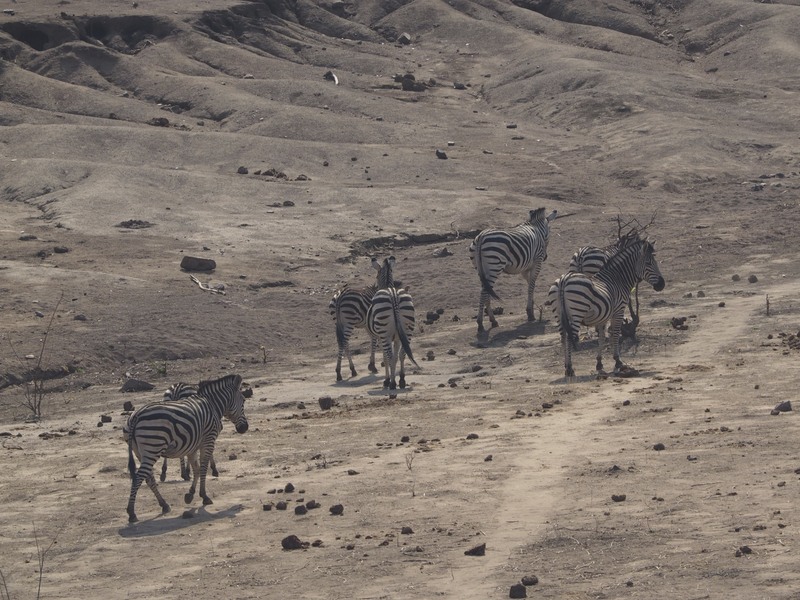 On only one occasion did we get close to Burchell’s Zebra. On a couple of occasions we encountered fresh tracks of Black Rhino but we could never find the beast itself. Perhaps just as well, the last few years have seen many rhino killed by poachers. There are possibly as few as nine left in Hwange, the future looks very bleak for impotent Chinese, they may have to switch to Viagra. On the other side of the coin the park is overburdened with elephant. They are doing considerable damage to the Baobab trees which are soft enough for elephants to eat. Leon predicts that there will be next to no mature Baobabs in the park within a few years. 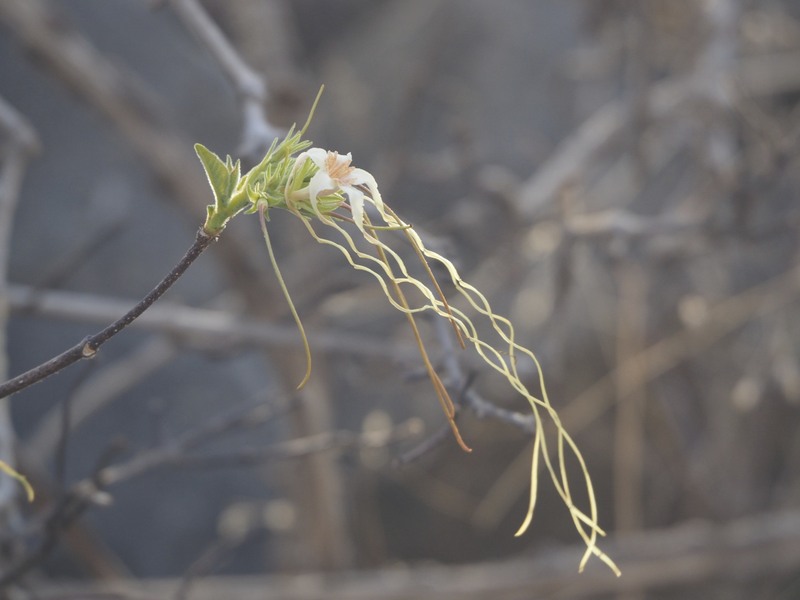 This is Strophanthus kombe, it’s one of the poison arrow plants. An arrow coated with a paste containing just three seeds will kill a giraffe. So, is a walking safari for you? The accommodation is a tent with an outdoor shower and toilet en suite. Luxury no, but you will survive so long as you don’t walk off the cliff in the dark. Food is pretty good for camp cooking. Alcoholic beverages are included. You need to be fit enough to back up a few long hot dry days of walking with enough in reserve to run on demand. It’s not for you if you will spend all your time frightened that the animals might kill you. They might … we all have to die some time. Leon delivers what Leon delivers, that is a lot of walking and as many of the big five as he can find. I think if you said to him at the outset that you were only interested in hairy caterpillars he would go out of his way to deliver a lot of walking and as many of the big five as he can find! He really has no idea why hairy caterpillars or, for that matter, little brown birds are of any interest to anyone. If you are primarily interested in photographing the wildlife you would do better from a vehicle. Animals permit closer approach of vehicles and a good guide will anticipate an animal’s movements and put you in position, sun over your shoulder for that perfect shot. On foot you have to take what the situation permits. To approach a single elephant on foot is worth a hundred sightings of elephant from the back of a vehicle. When you’re afoot everything is of significance. Wind direction, terrain, vegetation, how the animal is behaving. To walk in Africa is to be part of Africa. The group in the river bed was on our right the wind was from the right. The bank was lightly wooded with Mopane just like the photograph above. It limits visibility but one can walk through it fairly easily. Off to our left a male elephant caught our scent, trumpeted and charged. It came through the Mopane scattering the bushes. Four puny humans turned and ran. Because of our starting position the two tourists were bringing up the rear. Obeid, the tracker, was magnificent. After a few steps he stopped and stood his ground with his hand gun raised. “Run” he urged as we passed him. Leon led the way. In the gravel of the river bed progress was slow, I was thinking that four large flat feet would find it rather easier than my two size nines. Then behind us Obeid burst into gales of laughter and called us to stop. He beckoned us back. I could think of a number of better directions to take but Leon was keen to see what the story was. Obeid was excited, his usually good English was unable to keep pace with the retelling. So in a mixture of English, Ndebele and charades we were treated to the story of the elephant that charged, snapped the small Mopane like match sticks but finally hit a tree that withstood the onslaught. Only just, it was now standing at a crazy angle with the bark missing from a large area on one side. The force had caused the elephant to lose its footing and stumble. When it picked itself up it decided it didn’t need to charge any more. Obeid’s grandchildren will hear this tale and thanks to him so will mine. It was a big day for wildlife. 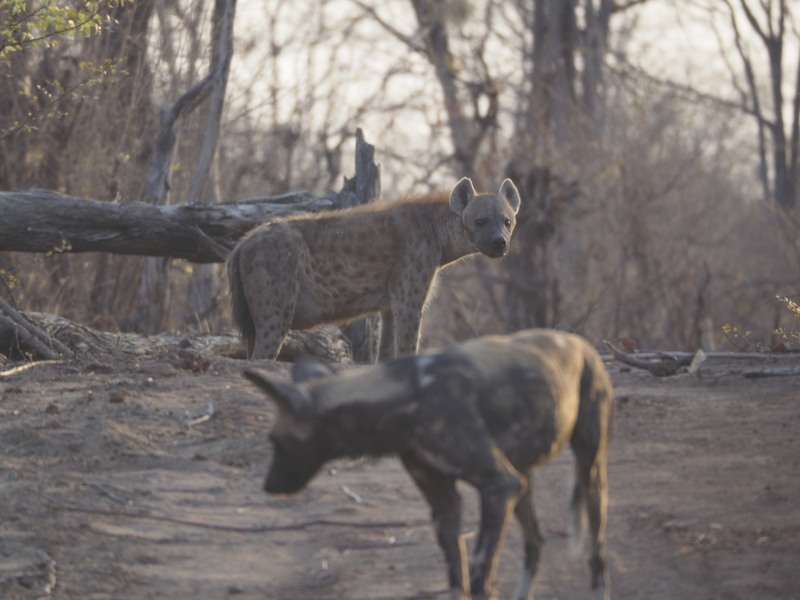 We had already seen Spotted Hyena and Wild Dog and later in the day we would encounter a pride of Lions. It was late morning and getting very hot. The lions were asleep in long grass. We were blissfully unaware of each others presence. We were moving almost silently. Obeid pointed out some tracks, Leon said “Lion”. Twenty metres away five lions got the shock of their lives and scattered in random directions. For a moment two were heading straight for us but realised their error immediately. And they were gone. All over before the scene could be processed, no chance for a photo. There is something very special about Africa, the cradle of mankind, the hint of danger, the landscape, large fierce animals. Life is so real … and so fragile. 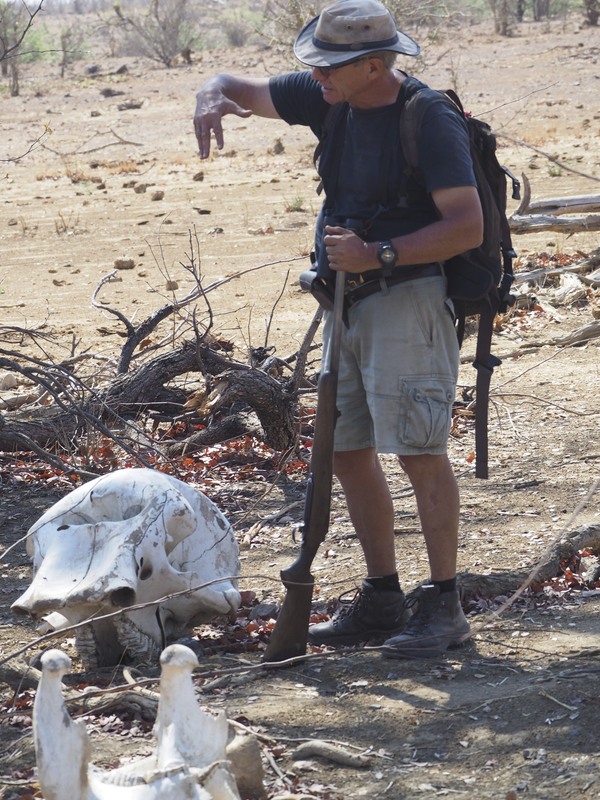 My companion on this occasion is Mark*, a professional biologist whose work in Australia mainly concerns wildlife monitoring. He is a joy to travel with, he is fascinated by everything, whinges about nothing and can shed light into every corner of the natural world. 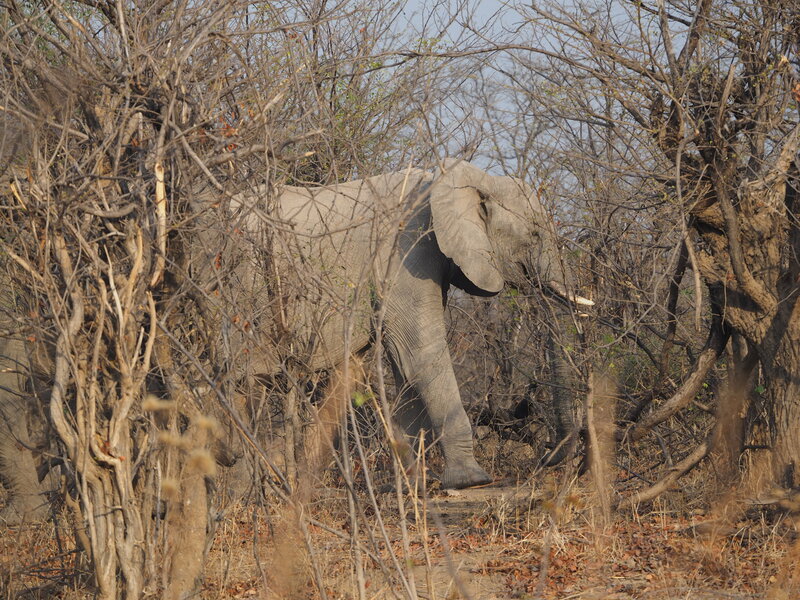 First step was Hwange National Park in Zimbabwe and a Leon Varley Walking Safari. The accommodation was a base camp on the edge of a cliff. Leon picked us up in Victoria Falls and was keen to get the three hour drive done before dark so that we could appreciate the importance of not wandering over the cliff. We would not have been the first to do so. All the big five are here and they can all do you serious harm or kill you. Don’t run unless I tell you to run, especially with Lion. Your instinct is to run, theirs is to chase. I’ve had to shoot three lions in the last 24 years, twice it was because someone ran. I’m not going to do it again, run and I’ll let nature take its course. If I do tell you to run, keep me between you and the animal and stay on your feet. Follow direction. If we come across poachers get down on the ground and stay there until I sort something out. Obeid, the tracker leads the way. He is armed with a hand gun. Leon follows with a bolt action rifle across his shoulders, it has a cartridge in the breech and two more in the magazine. Then comes Mark, I’m in the rear. There is an old saying about not needing to outrun the lion, just your nearest companion. I look around and for the first time in my life come to the conclusion that I’m the slowest in the group. The route took us through Mopane woodland to a lake which we then skirted to where we were picked up and taken to camp for lunch. It was the very end of the dry season, if the country had a tongue it would have been hanging out. 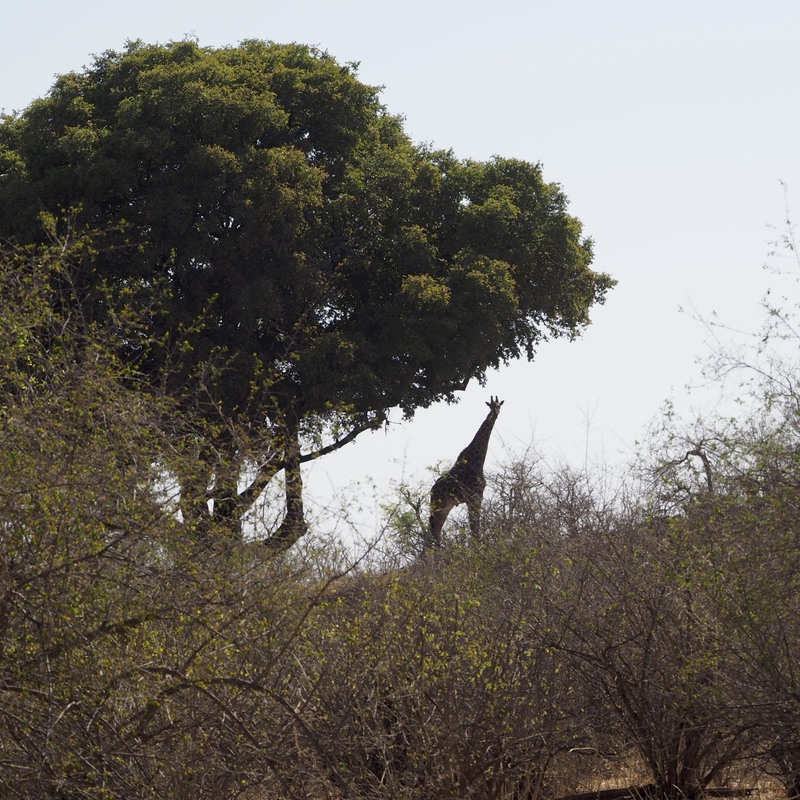 The Mopane can grow into a fairly substantial tree putting the leaves out of reach for all but giraffe. The elephants seem determined not to let that happen. 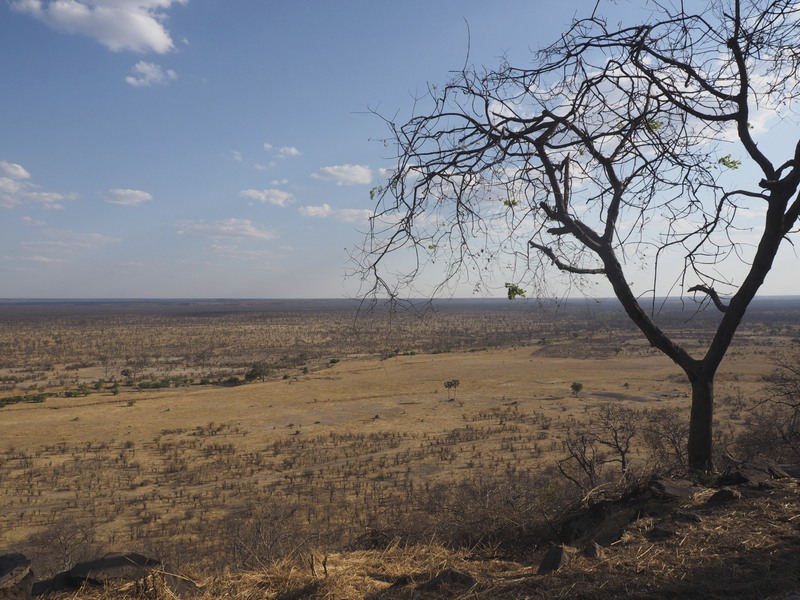 Large areas of Mopane were broken off or of no great age, bringing the browse line down to a level that smaller animals can reach. The bushes in the foreground are Mopane just coming into leaf. A large herd of Cape Buffalo are also heading to the lake. They are quite strung out, the females and young make the pace and get the best of the feed. The males bring up the rear, over time the poorer feed causes them to lose condition and drop off the back. The front of the herd is well ahead of us, we can’t beat it to the lake. Nor can we pass through it. Since we need to get from the right flank to the left we must pass behind it. Cautiously, because that’s where those grumpy old men are. Of the large animals only hippos kill more people than buffalo, elephant follow in third place. You can’t entirely forget about the carnivores but do show respect for the vegetarians. At the lake it’s all happening, as well as the buffalo there are elephants, impala, chacma baboon, warthog, impala, crocodiles, hippos and four people on foot. Welcome to the real Africa, stay alert, think about where the wind is taking news of your presence, watch how the animals are reacting and have a nice day. We had walked about 12 km for the morning by the end of which it was becoming very hot. Lunch was basic but good. At 3pm we headed off again for a further 8km or so. This was the pattern for the next few days. The dining tent was pitched at the cliff edge, from its shade we could watch a water hole that the local wildlife had scraped in the bed of the dry creek below, not a moment of daylight need be wasted. * Name changed to preserve his privacy.